Photograph supplied and approved for use by Sikorsky. Sikorsky Aircraft Corporation, part of United Technologies and headquartered in Stratford Connecticut in the USA, is a world leader in the design, manufacture and service of military and commercial helicopters; fixed-wing aircraft; spare parts and maintenance, repair and overhaul services for helicopters and fixed-wing aircraft; and civil helicopter operations. Their helicopters are used by all five branches of the United States armed forces, along with military services and commercial operators in 40 nations. Sikorsky is a long term customer of Spectrum Technologies, already possessing six CAPRIS® laser wire marking systems. 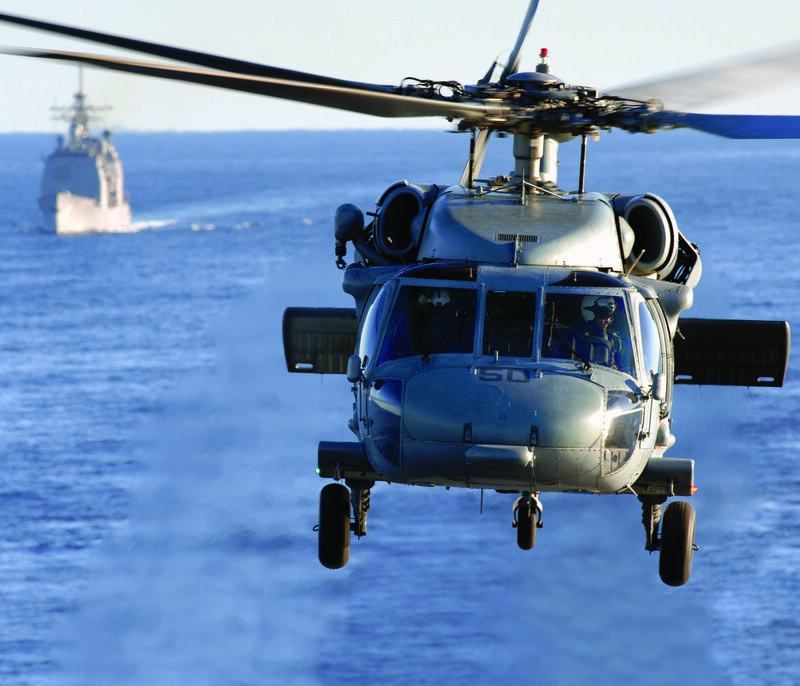 In 2007 Sikorsky was also the launch customer of Spectrum’s innovative Nova™ 880 UV laser wire marking system – the fastest laser wire marker available. 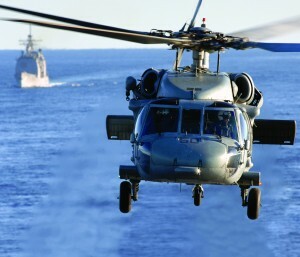 Sikorsky approached Spectrum with a challenge; a high proportion of the wire and cable used in their naval helicopters is black filter line wire which is non-markable by UV laser. They therefore needed a high speed system that would mark these wires with a similar permanence to the marks produced by a UV laser on the standard aerospace wire. Previously Spectrum had supplied a white inkjet wire marker with UV cure to mark this type of wire, which was based on Spectrum’s CAPRIS 100 laser wire marker platform. This system was unique and was now 13 years old and in need of replacement. So the challenge was set: Spectrum had to develop a new inkjet product, incorporating the latest inkjet and UV curing technology, and using their current Nova laser marking systems as a platform. The solution had to focus on marking the wire at rates twice as fast as the previous system supplied 13 years ago, and would include a stacker for wire collection instead of a coiling pan, to improve productivity. NovaJet™ was born. Spectrum worked very closely with Sikorsky throughout the project with bi-weekly conference calls with the USA to discuss progress. In total the development lasted 9 months, from initial samples to prove the inkjet process to the creation of a concept design and machine to the building of the finished product. Visits to the Sikorsky site in Connecticut took place during the process in order to agree the main technical specification of the project and feedback was taken from the previous machine for further improvements to be made. NovaJet build was completed at the end of September 2009. 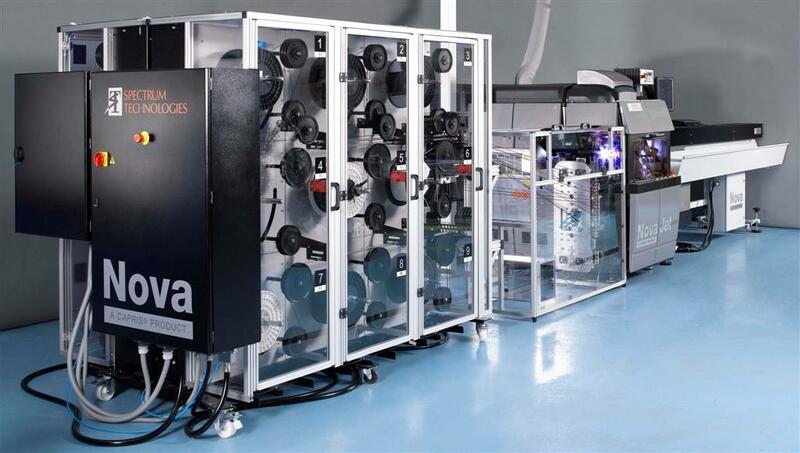 The Sikorsky system is an automated system with an automatic wire select and loading system (ASL) and comprises a single white inkjet head and UV lamp for curing the ink. The Sikorsky engineers came to the UK to fully test and accept the machine in October. The NovaJet system and stacker, accompanied by an 18 station dereeler was delivered and installed at the end of November 2009. Spectrum is pleased to announce that it received a subsequent order for a NovaJet system from a key Sikorsky subcontractor and numerous enquiries from many other key wiring harness companies. 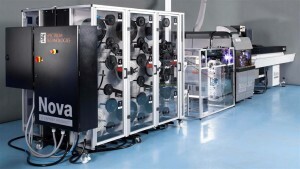 NovaJet is also available as a manual loading system for processing one wire type at a time, and can also be fitted with twin inkjet heads offering, for example, combined black and white inkjet marking capability.